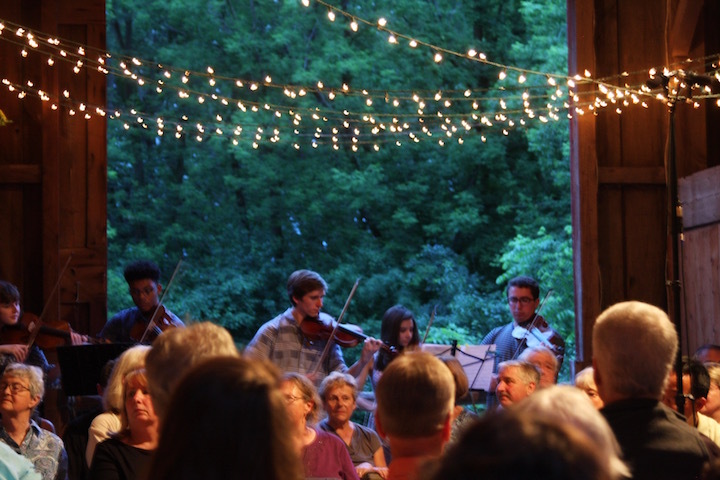 The ever-popular barn concert this Saturday night, July 7, at 7:30 p.m., at the centennial “Boston Farm” will feature Green Lake Festival Chamber Music string faculty and students, and will include their signature “Circle of Sound” performance that surrounds the audience. The faculty includes international chamber musicians of the Boston and Seattle Chamber Music Societies who perform regularly with concert pianist Andrew Armstrong, the director of the Chamber Music Camp. Students also come from all over the country, and this year a violinist from South Korea is a participant. Registration for FREE tickets had been closed at the barn’s capacity, but so many have asked to attend this concert that the Festival is providing overflow seating at tables at the base of the barn where the music can be heard through the large opening above. Hors d’oeuvres and a cash bar begin at 6:30 p.m. with the concert at 7:30 p.m. Admission is FREE, and donations will support the Green Lake Festival Chamber Music program. The event is located at W3320 State Road 23 in Green Lake, Wisconsin. To read about the Chamber Music faculty or see more information about the Festival, go to: www.GreenLakeFestival.org, or write to info@GreenLakeFestival.org, or call (920) 748-9398.